Let’s not waste time. 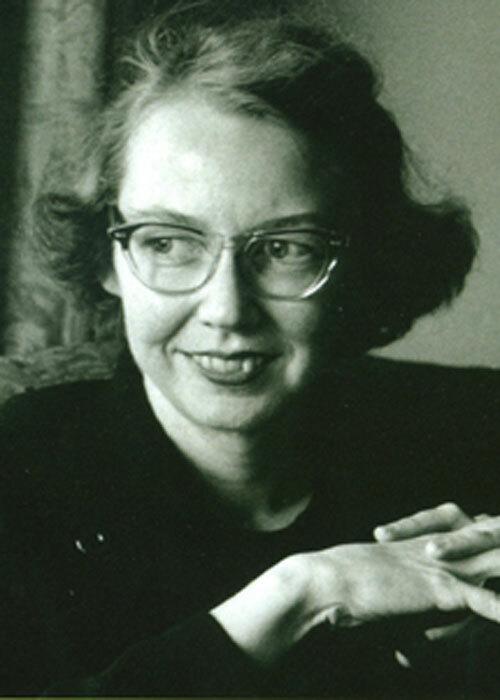 I’ve got 800 words to tell you about Flannery O’Connor. It would take considerably more, but this is only by way of an introduction. O’Connor was Southern, very Southern (listen to a recording). Born in Savannah, Georgia, she lived a sad (but happy) sort of life, succumbing early (aged 39) to lupus. Sad/happy in the same way her work was strange/beautiful, full of horror, but redemption. Maybe because she was Catholic, very Catholic, and wrestled with religious contradictions her whole life. The standard image is of O’Connor on the porch of her country home at Milledgeville, feeding the lyrebirds, clutching her callipers. Young O’Connor was precocious, bookish, a loner, never a kid to suffer fools. Apparently she taught her chicken to walk backwards (see below the 1932 footage of her as a child trying to convince the world), but we may never know. The strangeness of a strange chicken lingered, manifesting in potato peelers and dwarfs. But for now, I discovered her through her short stories, nearly all masterpieces. Here’s Joy Hopewell, a leg lost in a childhood shooting accident, going on a picnic with the bible salesman Manley Pointer. Alcohol is involved, condoms and Corinthians, before he asks to look at her prosthetic leg. About now I, you or anyone gets this strange feeling, like, Where the hell is this going? Well, you learn with O’Connor, just hang on for the ride. I found out the crime don’t matter. You can do one thing or you can do another, kill a man or take a tire off his car, because sooner or later you’re going to forget what it was you done and just be punished for it. From the stories to the novels. The two, at least, she wrote, forming a new theology, a Deep South biblical tale-tellin’ that drips with regret, confusion, insanity. Like O’Connor needed to invent a way of combining place and time, people and faith, past and present, the death she was staring down every day, and the hope for some sort of eternal life. In the form of Wise Blood, a 1952 novel that transcends time, and lands up on almost every list of books y’all gotta read. John Huston’s 1979 movie adaptation is worth a look, but it’s in O’Connor’s sparse, give-nothing-away prose that the full shocking experience lies. Firstly, we meet Hazel (Haze) Motes. Newly discharged from World War II, he returns to his Tennessee home to find it deserted. He buys a hat and coat and, looking every bit the preacher, catches a train to Taulkinham, where he finds a phone number on a bathroom wall and calls a prostitute named Leora Watts. But Haze is more interested in telling her about his newly-discovered theology, or anti-theology, as it turns out, where ‘the blind can’t see, the lame don’t walk, and the dead stay that way.’ Haze begins his mission to establish the Holy Church of Christ Without Christ. He sets about convincing others, but maybe just himself, that everything he’s been taught about God is a lie. Your conscience is a trick, it doesn’t exist, and if you think it does, then you best get it out in the open, hunt it down and kill it. Violence is ever-present in O’Connor’s work. It acts in opposition to whatever she understood to be grace. This random, cruel (but slow) twisting of the knife between the ribs. So, Haze meets an 18-year-old zookeeper named Enoch Emery who has just been kicked out of home by his abusive father. He tells Haze about the notion of wise blood. The idea that wisdom, the path forward, the answer to the question that’s never been asked, is in certain people’s blood. Enoch’s brain was divided into two parts. The part in communication with his blood did the figuring but it never said anything in words. Then comes the potato peeler demonstration, and as Haze and his new disciple watch, a blind preacher named Asa Hawks and his daughter, Sabbath Lily Hawks, disrupt proceedings. Asa, we later find out, (apparently) blinded himself at a revival meeting when he ‘thrust his hands into [a] bucket or wet lime and streaked them down his face’. Soon, the Hawks’ ministry of two goes head-to-head with the Motes’ anti-ministry and things get stranger. Emery thinks his Christless church would work better with a saint, and breaks into the local museum to steal a mummified dwarf. Maybe it’s me, reading too much into this part-fiction, part-spiritual myth? O’Connor was a writer who died too soon, entering her own mysterious world, leaving a handful of brilliant stories and two great novels. Who believed ‘people without hope not only don’t write novels, but what is more to the point, they don’t read them’. In his previous article in this series, Stephen Orr considered Malcolm Lowry’s booze-soaked novel Under the Volcano.